and this one is BIG! I’m so happy that this event is being held in so many cities, after getting so excited about the Stand Up for Refugees Rally in Melbourne and then realising I couldn’t make it! 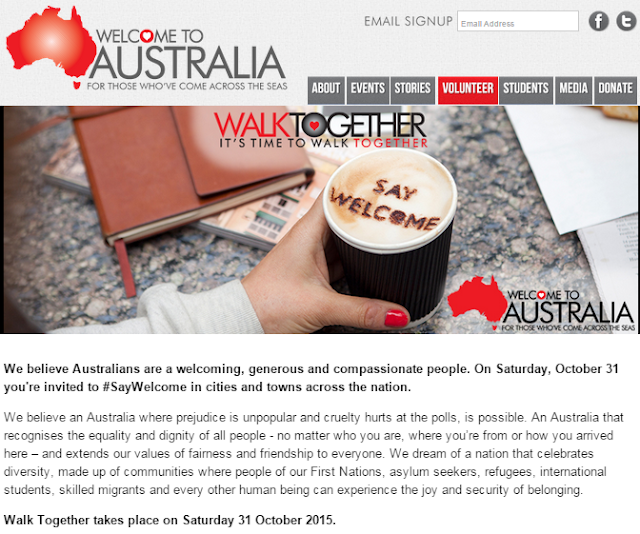 After a wonderful successful march in Walk Together is holding events in over 20 cities. Brisbane: Kurilpa Point Park South Brisbane 11am, walking to Supreme Court Plaza George Street. Canberra: Westside Action Park, 11am. Mildura: Mildura Lawn Tennis Club, 9:30am, walking to Nowingi Place for speakers and festivities. Wagga Wagga: Lake Albert Apex Park, 10:30am for registration. Walk at 11am, followed by a BBQ! Whyalla: This event is on Friday the 29th to coincide the theHappiest Refugee Live Show. Meeting at 6pm at Westlands food court for tea, walking at 7:10pm to Middleback Theatre for Anh Do’s show at 8pm. Tickets. Wollongong: MacCabe Park at 11am, walking to Market Square for a family festival day of music, performances, picnic lunch (bring a plate!) and speeches. How awesome is that! I really hope you can all make it to one of these cities on or around 31 October. Further information is still being released for many of the cities so watch this space! ‘If we’re all people, we’re all equal’.